If you're a lover of Greek food and live anywhere near Beaverton, you're undoubtedly familiar with Antoni's – the second incarnation of a famed Greek restaurant that existed between Beaverton and Hillsboro for many years. 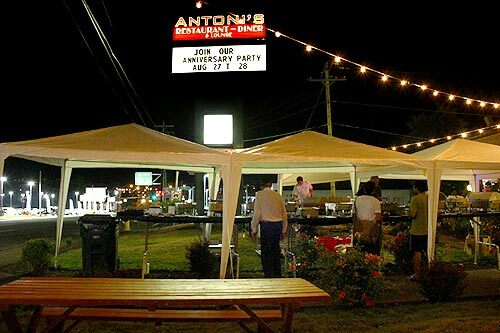 It's been a year now since Antoni's came to occupy the old Carrow's restaurant building in Beaverton's “auto row” area, near where Canyon Road meets Highway 217. If you weren't there, you missed quite the shindig in late August. Antoni's celebrated its one-year anniversary just before Labor Day weekend, days and nights where Greek treats flowed like mythological Ambrosia of old - and traditional music wafted as well. That, along with the proliferation of Greek-speaking natives chatting around you gave the distinct feeling you'd been briefly transported from SW Portland to some slightly more exotic locale. A massive tent outside held much of this all-you-can-eat buffet of sorts, where a variety of special items not normally on the menu were in abundance, showing off what this place can really do. Their trademark gyros were indeed some of the high points, but other highlights included some fantastic desserts made just for this occasion, their always eye roll-inducing baklava and some charred lamb that was essentially a kind of mouth-gasm. Inside scoop: the late night celebrations there purportedly got quite wild with plates being broken in true Greek fashion – along with a few cellphones and drink glasses. 10765 Southwest Canyon Road. Beaverton, Oregon. (503) 601-8522. Also in Beaverton, a little Middle Eastern secret recently changed names. Hush Hush Cafe, in the downtown Beaverton Fred Meyer complex, changed hands and is now called Gyros2Go – a little easier to remember and it makes a little more sense. At first a bit of a rocky start, it has actually improved a bit on the already fantastic menu that hovers around Lebanese cuisine. It's still extremely reasonable – one dare say cheap, with most dishes quite huge and between $7 and $11. But their sense of freshness and flair for spices is still unmatched and it has actually gotten a little more tasty. Inside scoop: Gyros 2 Go is really the best kept secret in Portland and it should not remain so. Get with it, Portlanders. 11409 SW Beaverton Hillsdale Hwy. Beaverton, Oregon. (503) 520-9800. The 11th Annual Wild About Game Festival sponsored by Nicky USA happened in the mountain town of Welches, Oregon on September 18, and the first place winner was the chef from Metrovino in Portland. Chef Gregory Denton grabbed that spot with his innovative Duck S’mores dish. The competition also yielded a surprise tie between Portland chefs Matt Christianson of Urban Farmer and Erik Van Kley of Little Bird for third place. The 2011 Wild About Game judges included Savuer Magazine Executive Editor Dana Bowen, Eater.com National Editor Raphael Brion and local game expert and cookbook author Janie HIbler. The event included cooking demonstrations from chefs like Bernard Malherbe of The Crooked House, Salem, OR presenting the Fermin Iberico de Belotta, and Brendan Newell and J.B. Tranholm, Pok Pok and Whiskey Soda Lounge demoing wild boar collar. Second place was taken by Naomi Pomeroy of Beast in Portland for a confit squab leg and chanterelle. For those needing a wee sugar fix with a gourmet slant over the upcoming Halloween holiday season, Portland's Pix Pâtisserie is unleashing a new chocolate and marzipan treat. The edible figurines are the perfect treat for any Halloween celebration and are available beginning October 10 through Halloween. The miniature edible ghosts are made from a chocolate ganache covered pecan draped with a marzipan “sheet” and a marshmallow jack-o-lantern in tow. Each Trick-or-treater figure is $3.75. For trick-or-treaters of all ages, Pix will pass out sweet treats to everyone in costume starting at 5 p.m. on Monday, October 31st. Pix Pâtisserie North, 3901 N. Williams Avenue, Portland; 503-282-6539; and 3402 SE Division St., Portland; 503-232-4407. www.pixpatisserie.com and on Twitter @PixPastisserie. Tags: north Portland restaurants, southwest Portland restaurants, Greek, Middle Eastern, desserts.